How much do you know about your city? in the sixties, this was still a "sundown" area and the members of CORE worked across racial lines to end school segregation, job and housing discrimination, and get a cross-town bus (#48!). Their work is not finished. These four inspiring women were part of the movement. Seattle was a very different city in 1960 than it is today. There were no black bus drivers, sales clerks, or bank tellers. Black children rarely attended the same schools as white children. And few black people lived outside of the Central District. In 1960, Seattle was effectively a segregated town. Energized by the national civil rights movement, an interracial group of Seattle residents joined together to form the Seattle chapter of the Congress of Racial Equality (CORE). Operational from 1961 through 1968, CORE had a brief but powerful effect on Seattle. The chapter began by challenging one of the more blatant forms of discrimination in the city, local supermarkets. Located within the black community and dependent on black customers, these supermarkets refused to hire black employees. CORE took the supermarkets to task by organizing hundreds of volunteers into shifts of continuous picketers until stores desegregated their staffs. From this initial effort CORE, in partnership with the NAACP and other groups, launched campaigns to increase employment and housing opportunities for black Seattleites, and to address racial inequalities in Seattle public schools. The members of Seattle CORE were committed to transforming Seattle into a more integrated and just society. Seattle was one of more than one hundred cities to support an active CORE chapter. Seattle in Black and White tells the local, Seattle story about this national movement. 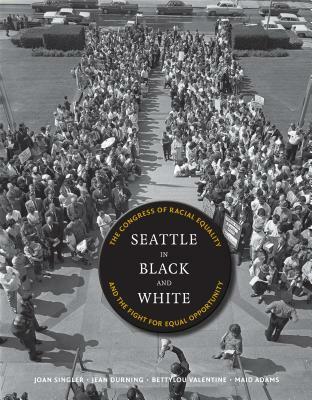 Authored by four active members of Seattle CORE, this book not only recounts the actions of Seattle CORE but, through their memories, also captures the emotion and intensity of this pivotal and highly charged time in America's history. Joan Singler was a founder of Seattle CORE and served as CORE secretary and chaired the Housing Committee. She has a bachelor's degree in psychology from the University of Washington and currently serves on the Washington State AARP Executive Council and works to support of victims of domestic violence. Jean Durning joined CORE in 1961 and organized some major CORE projects. Later she was active in political campaigns, taught junior high school and worked on opening environmental careers for minority professionals. From 1981 to 1993 she was northwest director of The Wilderness Society, helping coordinate volunteers of many environmental organizations, lobbying Congress, and dealing regularly with government agencies and with press and broadcast reporters. Bettylou (Burleigh) Valentine, a national board member of the NAACP, joined Seattle CORE in 1962 serving as secretary in 1964. She earned her MA and later her PhD in anthropology; she is the author of Hustling and Other Hard Work. She and her husband also taught, researched and wrote in Suriname, South America, Papua New Guinea and China. Back in Seattle, she directed Central Youth and Family Services for sixteen years. Maid Adams joined Seattle CORE in 1962. She served as coordinator for employment negotiations and was a co-principal of the Freedom School at the First AME Church. She returned to the University of Washington to earn her Masters degree in educational psychology and then served for twenty years as a program director at Green River Community College. She continues to teach and maintain community activities.